A new animation showing a simulated flight over the surface of dwarf planet Ceres using images from NASA’s Dawn spacecraft in its high-altitude mapping orbit has been produced by members of Dawn’s framing camera team at the German Aerospace Center, DLR. The movie emphasises the most prominent craters, such as Occator, and the tall, conical mountain Ahuna Mons. 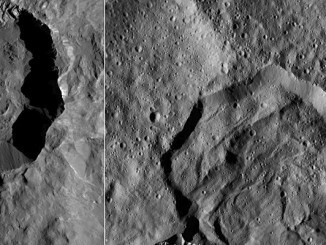 Features on dwarf planet Ceres that piqued the interest of scientists throughout 2015 stand out in exquisite detail in the latest images from NASA’s Dawn spacecraft, which recently reached its lowest-ever altitude at Ceres. 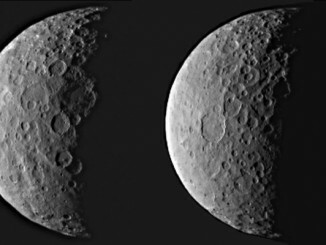 Dawn took these images near its current altitude of 240 miles (385 kilometers) between 19 and 23 December 2015. 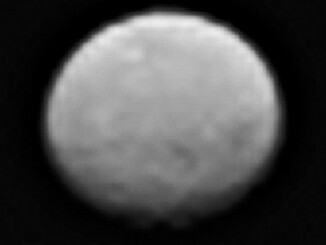 NASA’s Dawn spacecraft, cruising in its lowest and final orbit at dwarf planet Ceres, has delivered the first images from its best-ever viewpoint. 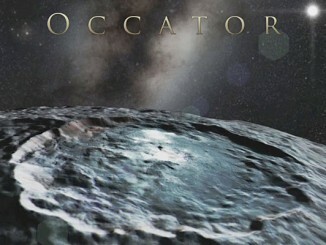 The new images showcase details of the cratered and fractured surface. Dawn is now approximately 240 miles (385 kilometres) above Ceres, which is where it will remain for the rest of its mission. The brightest spots on the dwarf planet Ceres gleam with mystery in new views delivered by NASA’s Dawn spacecraft. These closest-yet views of 57-mile-wide impact crater Occator, with a resolution of 450 feet (140 metres) per pixel, give scientists a deeper perspective on these very unusual features — though the precise nature of the spots remains unknown. 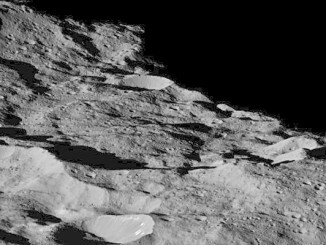 NASA’s Dawn spacecraft has delivered the closest-yet views of Ceres, showing the dwarf planet’s surface in unprecedented detail — including the small world’s mysterious four-mile-high conical mountain. 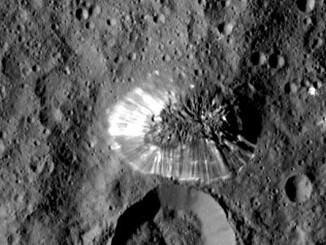 At its current orbital altitude, Dawn takes 11 days to capture and return images of Ceres’ whole surface at a resolution of 450 feet (140 metres) per pixel. 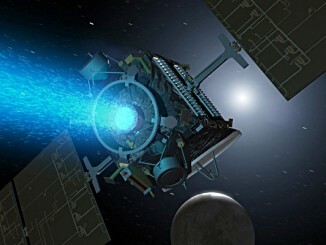 One month after its capture into orbit around Ceres, NASA engineers working on the Dawn mission state that the spacecraft is performing flawlessly and about to start capturing optical navigation images on April 10th. 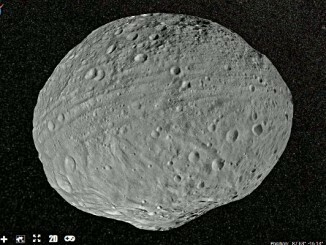 Data gathered from multiple instruments aboard NASA’s Dawn spacecraft have been compiled into Vesta Trek — a free, web-based application that provides detailed visualisations of one of the largest asteroids in our Solar System. 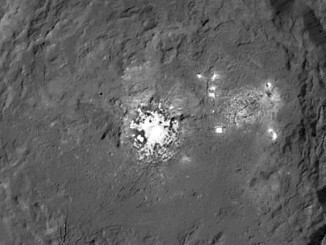 Are volcanoes responsible for twin bright spots on Ceres? As NASA’s Dawn spacecraft heads for its historic rendezvous with dwarf planet Ceres next week, further mysteries unfold on the small world. Now seen in higher resolution, a volcano-like bright spot has a nearby companion. 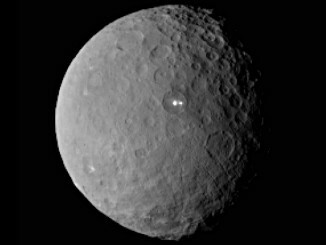 NASA’s Dawn spacecraft is now less than two months away from capture into orbit around Ceres for a 16-month study of the dwarf planet — and its cameras are already revealing tantalising surface details.